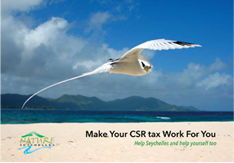 Nature Seychelles is a leading environmental organisation in the Western Indian Ocean. It is the largest and oldest environment NGO in the Seychelles archipelago, where it is involved in environmental conservation and management. It is an association registered in the Seychelles with a board of Trustees, and a local and international membership since 1998. It is also the BirdLife Partner in Seychelles, a member of the World Conservation Union (IUCN), and the Western Indian Ocean Marine Science Association (WIOMSA). Nature Seychelles manages the world-famous Cousin Island Special Reserve, one of the oldest marine protected areas in Seychelles. Nature Seychelles employs 15 full time staff including biologists, an economist, educators and protected area specialists. The primary objective of Nature Seychelles according to its statutes is to improve the conservation of biodiversity through scientific, management, educational and training programmes. The Association achieves these objectives through affiliations, amongst others, with individuals as well as local, national, regional and international institutions engaged in the process of environmental conservation.